Introduction by Anne Lowe to her late husband Raymond’s collection of Hampstead Garden Suburb postcards. 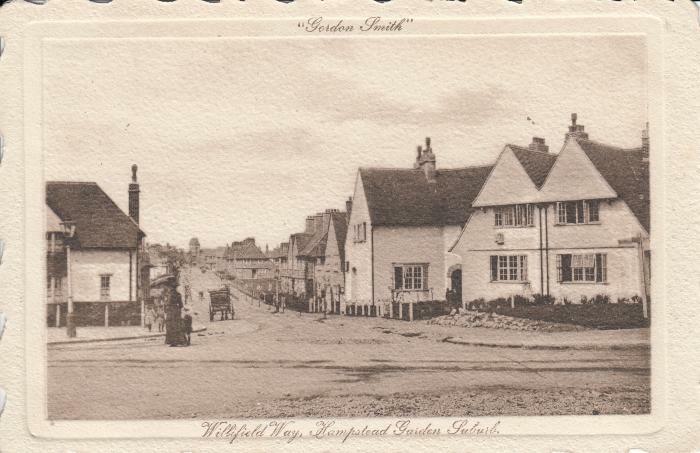 This is a collection of postcards, old and new, of Hampstead Garden Suburb which have been acquired by various means over many years and tell part of our family history as well as a Suburb history. I am third generation “Suburb”. My grandparents moved into newly built 106 Willifield Way. My grandfather William Francis Faulkner was from Hampstead. He and his young wife, Annie, and their two year old daughter Edith (my mother) were soon to be joined by baby Francis Aylward Faulkner who was born at 106 Willifield Way. In the collection there are postcards of Edith in the very new bare back garden, of neighbours, of the house, of the two children at Garden Suburb school, of Edith’s wedding to Ernest Brown at St. Jude-on-the-hill in 1931 (church west end not complete), of the Belgian refugee who had lived with them a while at the outbreak of WWI. These pictures have been augmented with cards given to my husband by local residents or by attending postcard fairs all over the country. Suburb postcards are as rare as hens’ teeth! Raymond was an avid collector always enjoying searching through boxes and boxes of old postcards in the hope of finding one or two to add to his growing collection. Postcards are a valuable source of social history as you will see.